Tasting Jameson’s range of whiskeys for celebrating St. Patrick day. A wonderful sweet and delicate pot still experience like only Irish know how to do. 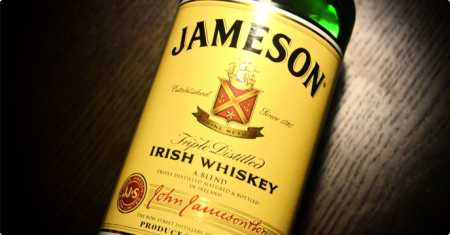 It is about time for a Jameson whiskey review! Ouch! I am seriously lagging behind. I were going to do this tasting for St. Patrick’s day with Steve from The Whisky Wire but unfortunately was ill and couldn’t attend. So Miss Whisky stood up and manned this tasting with a lot of great whisky friends. To be fair, I tasted some of the Jameson on the old days when I began drinking whisky and the experience wasn’t nice or interesting at all. I am curious to revisit some of them about 1,200 whiskies later. Jameson is carefully distilled 3 times from the finest barley and crystal clear water and matured for long years in oak casks to produce an exceptionally smooth whiskey. Nose (86): more than average. honey, citrus, vanilla, corn. Palate (85): light, smooth. honey, herbal, corn, candies, cinnamon, vanilla. Finish (84): average. honey, vanilla. So based on other whiskies I have already tasted I rate this Jameson with 85 points over 100. 70cl / 40% - A special pot still malt whiskey heavy version of Jameson. Select Reserve has lots of first fill bourbon and sherry casks in the mix giving it a much richer flavour than regular Jameson, with a strong sherried note. Nose (90): more than average. honey, pineapple, vanilla, citrus, toffee, herbal. Cracking nose! I love it. Palate (90): powerful, oily. honey, citrus, vanilla, spices, corn, pepper, raisins. So based on other whiskies I have already tasted I rate this Jameson Select Reserve Small Batch Irish Blended Whisky with 90 points over 100. Nose (90): more than average. honey, vanilla, pineapple, mango, wood, citrus. It is less sweet than the other Jameson I have tasted today. Palate (89): powerful, oily. honey, fruits, pineapple, apples, vanilla, herbal, citrus, tropical fruits. Finish (89): longer than average. honey, citrus, fruits. So based on other whiskies I have already tasted I rate this Jameson 2007 Rarest Vintage Reserve Blended Irish Whiskey with 89 points over 100. I wasn’t expecting such improvement. Really most of them are quite nice, even the Original that although it is a bit light it is a sweet and with notes of cereals that makes it quite interesting. My favorite is the Select Reserve and then in a second position the Rarest Vintage Reserve. It has been a great experience to retaste them and discover a quite decent drams… with the Select reserve being quite fantastic. Good that I got a bottle of it! Time to open it.